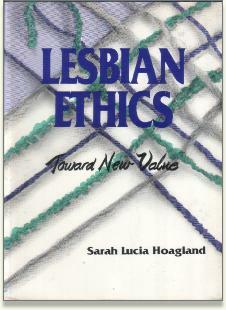 Lesbian Ethics: Toward New Value uses lesbian experience as a starting point for redefining ethics. The overall thesis is that the values from anglo-european ethical philosophy undermine rather than promote lesbian connection. Challenging control in lesbian relationships, the book develops an ethics relevant to lesbians under oppression — one which avoids both blaming the victim and victimism, embraces the spirit of lesbian resistance, and encourages plurality. Lesbian Ethics:Toward New Value can be ordered by Fax ,USPS Mail or Email. $14.95 (USD) plus $5.00 S&H for one book shipped Media Rate to a US address. Please download the Lesbian Ethics Order Form for complete ordering information.